On a personal note, as a long time Scouter and a former member of their professional staff…I wrote this letter published in Bay Windows, the newspaper serving Boston’s gay LGBT community. 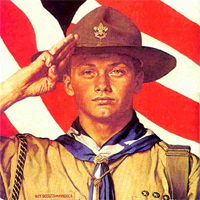 The Boy Scouts of America’s old policy of totally discriminating against gays was a train wreck of a strategy, driven by a culture within Scouting’s leadership. The new policy— letting gay kids be Scouts but still banning gays and lesbians from being Scoutmasters— isn’t great, but it makes 100 percent acceptance inevitable. To make that happen faster, the BSA needs help from the LGBT community to make a cultural change. Both policies hurt honest young men and devalue people based on a stereotype, instead of valuing them the truth they stand for. To the current generation of scouts, this policy has marginalized the Scouting movement. This generation sees the many threats to the environment and wants to do something. This policy has made the Scouts unacceptable to natural allies such as public schools, charities like the United Way, environmental organizations and many corporate funders. It’s not like the old policy of 100 percent discrimination ever accomplished what it wanted to. As a long-time member of Scouting’s executive staff, I can assure you, the policy didn’t end gay men or boys from participating and benefiting from Scouting. All it did was cause needless pain, and confusion. I was a senior executive in the Scouting movement and a resident of Boston’s predominantly gay South End. That made me a natural point of contact for gay Scouters, and too often a witness of closeted (often married) Scouters visiting my fun neighborhood from the suburbs. No one I knew among Scouting’s leadership wanted to out gay Scouters. After all, good leaders of any orientation are awesome and rare. Last week’s vote was huge. It wasn’t the half measure to shift from requiring discrimination to just allowing it. This assures gay youth membership, and it makes recognition of gay leaders inevitable. Create facts: Encourage gay kids to join Scouting and then join with them. Yes if you’re gay, it means not picking a fight with this still discriminatory tenet of Scouting. This is probably what gay leaders have done since Robert Baden Powell founded the Scouts in 1907. If you really think Scouting would be better with gay leaders, don’t wait for an invitation. This is it. Change culture: Sponsor an Eagle Scout at this year’s annual Eagle Scout dinner, you’ll get to meet them an explain what this movement means to you. Be a troop advisor (a Committee Member or Commissioner in Scout speak). Only have a few hours? Come to a fundraiser and bring a date. Be beautiful and proud and the other people there will talk about you for weeks. Give the boys in Scouting more choices about who to help: Connect them to opportunities to serve and be part of the community you value. Community Servings, Community Gardens; why not the Gay Men’s Chorus? Yes! Scout Day at the Gay Men’s Chorus. I want to come to this in 2013. Please! Because, if you make Scouting better, it will be. This will happen more quickly and better for all if you get involved, than if we just wait around for a recognition of equality to to just happen. While the Scouts still have more change ahead, advocates of equality can step-up to welcome this change and create a culture to help the evolution happen for the general good. If we’re going to do this, let’s do it right.